Believe it or not, some processes of the past are completely inefficient. Sure, we’re used to doing them, and maybe we’re faster at them than most, but technology is making our workplace more streamlined. 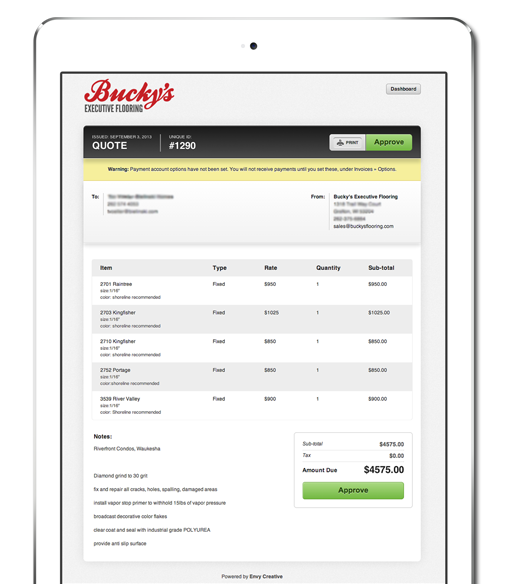 Bucky’s Flooring wanted to get on the bleeding-edge in their industry, and it was natural to start at the beginning of their sales process: the quote. Realizing that there wasn’t an existing web-based system available, owner Ryan Knapp reached out to the team that revitalized his company’s web experience. When Knapp described how the quote process worked, he handed over his three-piece quote sheet. One master copy, one customer copy, and another copy for office use. From there, Envy Creative determined that the online quote system would have to behave in a similar fashion. It needed to exist on a portable device. The quote needed to be delivered instantly to the potential customer’s inbox, but also have the option to print upon request. Finally, the quote system had to be web-based so that the support staff back at the Bucky’s Flooring office could track and convert. Upon submission, the quote is instantly available to the potential customer via email. When Ryan Knapp needed to revolutionize the way his company handles leads, Envy Creative was ready to help him make that a reality. The quote system has helped cut down on materials as well as the time spent onsite for their estimators. Both their customers and the office support team get to enjoy the flexibility and speed afforded by this different way of doing business. A truly above and beyond creation, and it all came from taking an old process and making it new. Have an idea that’s a little outside the box? Great, we are too. We love coming up with elegant solutions to tough problems. We can leverage technology to make your business run smoother and make your clients happier. Bring us your toughest problems and we’ll give you the best solutions.